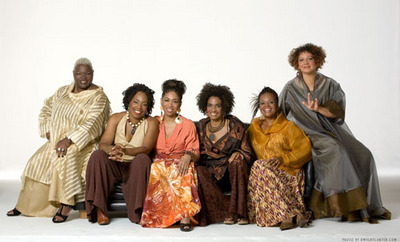 Posted on Sat, Feb 18, 2012 : 8 a.m.
From gospel to the blues to jazz to African spirituals and beyond, Sweet Honey in the Rock filled Hill Auditorium Friday with the stunning harmonies and vocal acrobatics that have defined the a capella group for nearly 40 years. And an Ann Arbor audience that already viewed the sextet’s members as old friends responded with an exuberant outpouring of love that’s seldom seen in the auditorium’s staid confines. They clapped along; they sang along; and, in the end, seemed to wring an extra bit of gusto from the singers. To be sure, Sweet Honey in the Rock deserved the adoration. Consisting of singers who complement one another perfectly and completely, Sweet Honey is a harmonic machine that exceeds the sum of its parts. At their best, as they were frequently on Friday, the singers create a sonic tapestry of melodic, harmonic and rhythmic threads woven together with precision, if little nuance. But Sweet Honey isn’t so much about nuance as it is about throwing everything out onto the stage and seeing what works. And when it does, the results are stunning. The 90-minute, 13-song show kicked off with the spiritual ”I’ve Been Buked and I’ve Been Scorned,” which created the template for much of what was to come: the singers trade lead verses, while the rest of the ensemble provides a soft foundation, often in harmony and with vocal sound effects to emulate various elements. The group was at its best when exploring southern gospel and African territory. A powerful prayer song from Mali provided a showcase for Nitanju Casel, whose voice fairly filled up the auditorium as her sustained wails drew a deserved round of applause. Bass singer Ysaye Barnwell is the not-so-secret weapon in the band. For most of Friday’s show, she underpinned the songs with in-the-pocket bass runs that were deceptively complex. But it was when she stepped up front so sing Nina Simone’s “Sielah” that she realy took control. Showing off a range that spans at least two octaves, she delivered the concert’s best moments on this cautionary tale about fast living. Not everything worked. A faithful reading of Bobby McFerrin’s “Don’t Worry, Be Happy” was pointless, if inoffensive. Not so a jazzed-up take on Bob Marley’s “Redemption Song,” which was neutered of all its subtlety not only by its peppy arrangement, but also an interminable, scatting solo by Aisha Kahlil. In fact, Kahlil’s showboating and constant jazz hands were a distraction throughout the show, even despite her strong and pleasant voice. These low points were the exception, though, and by the time the group returned for a one-song encore on the gospel number “Operator,” they were back to doing what they do best: creating complex art out of nothing more than the blending of beautiful voices. Sun, Feb 19, 2012 : 3:32 p.m. The concert was nice. But the production left something to be desired. The sound system is incredibly bad that mezzanine could barely hear most of the words. This is an affront to the audience that UMS would allow that to happen!!!!!!!!! !